and reminds us that our world is a canvas. FOUR LETTER WORD (2015, 2018) by Maya Hayuk. It’s a repurposed segment of a much larger mural rearranged just for the Beyond The Streets show. 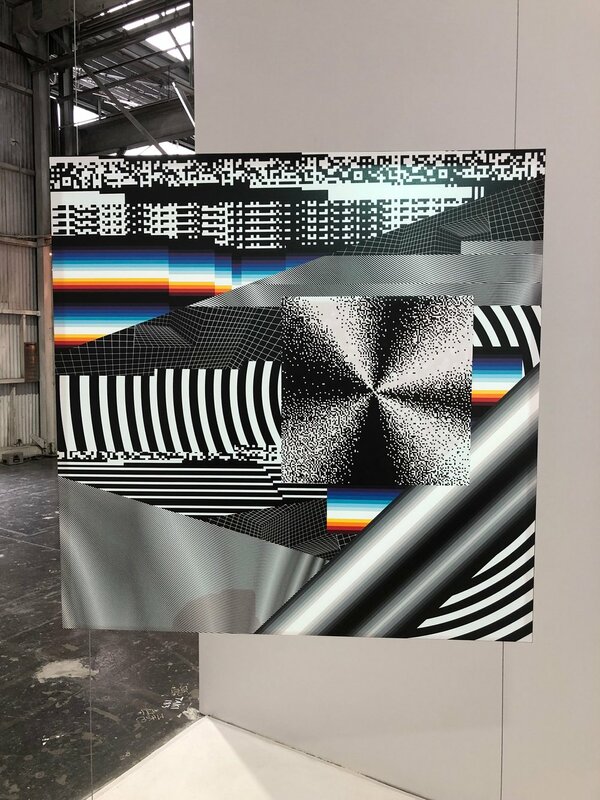 On the unnamed outskirts of Chinatown, tucked between the newly opened Los Angeles State Historic Park and the trickling L.A. River, there lies an oasis of color and creativity — at least, it’ll be there through July 6, when the Beyond The Streets exhibit is set to close. Curated by Roger Gastman (curator, street-art and graffiti historian, and the author of several books on the scene including Wall Writers: Graffiti in Its Innocence), the exhibition shows how over the past few decades artists have taken their work from the street to their own studios and in many cases right back to the street again, (mostly) legally. Beyond the iconoclastic messages expressed within, I’d say that this is the main message of the experience — tracing the triumph of ideas and practices once anathema to the establishment world of fine art to their ultimate acceptance and, now, full embrace (even by corporate entities and municipal governments). There’s a heavy focus on local L.A. artists but of course plenty of New York influence runs throughout the perfectly paced warehouse maze. 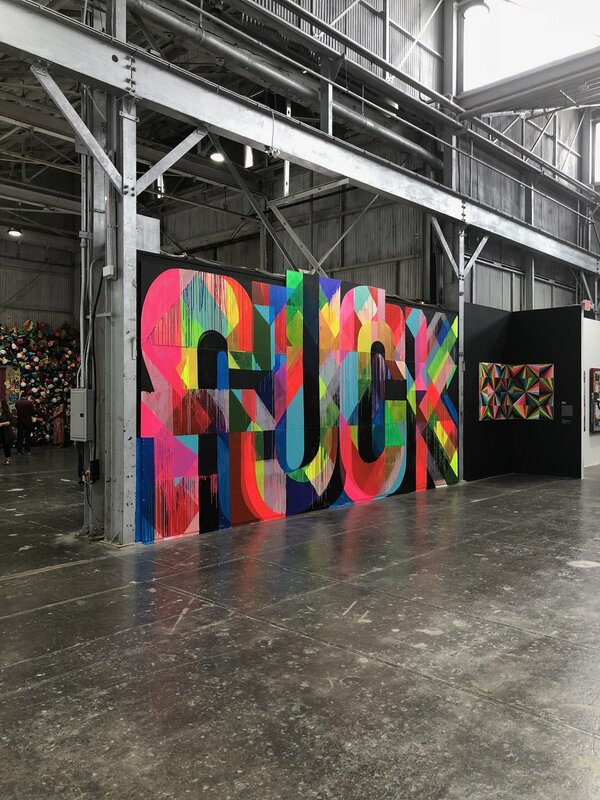 With work by over 100 artists, there’s a lot to wrap your head around — from Banksy to Basquiat, Murakami to Maya Hayuk, Maripol to Mark Mothersbaugh, and (as the title goes) beyond. Here are some highlights — really just a fraction of the show. All amateurish photography belowby me, shot on (my lovely wife’s) iPhone X. The line snaked around the side of the warehouse, through which we could glimpse this oversize blue steel sculpture by HACER. It’s actually part of a series of four sculptures called THE CHASE, which you might have seen driving along Santa Monica Boulevard at Doheny. RABBIT, SITTING. Sculpture by HACER. 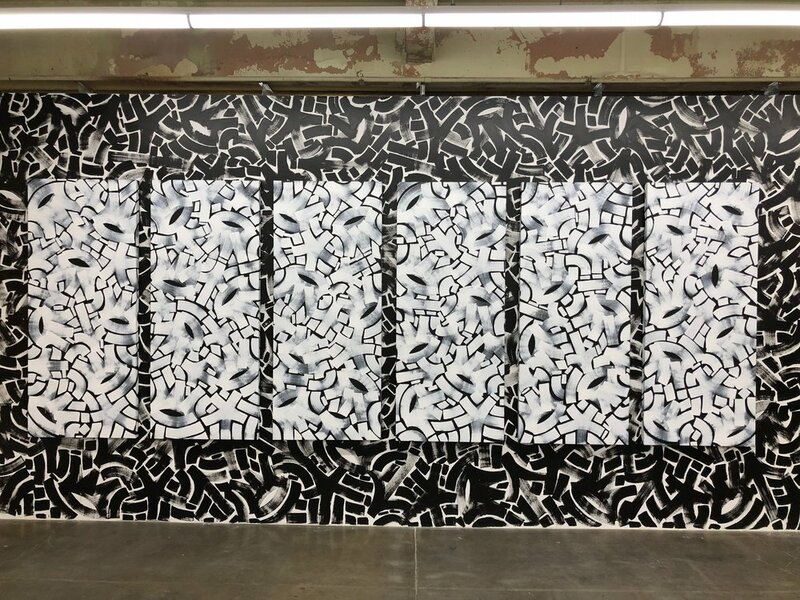 One of the first to give graffiti prominence and the first to turn his tag into a logo, NYC-based Eric Haze earned his spot near the entrance of this L.A.-centric exhibit. This wall-sized piece, Festival of Kings, is one of the first major works to be seen. It’s in a similar style to his famous Coney Island wall art. The photograph below, L.A. Fingers, was refused by multiple magazines for being reminiscent of gang culture. Oriol’s image became an icon of L.A. street art anyway. This photo graces the cover of the Beyond the Streets program and map. Keep an eye out for it out in the world and you’ll begin notice it used in tons of places. L.A. Fingers. Photograph by Estevan Oriol. This sculpture, L.A. Hands, is Slick’s Mickey Mouse–gloved version of the iconic photograph L.A. 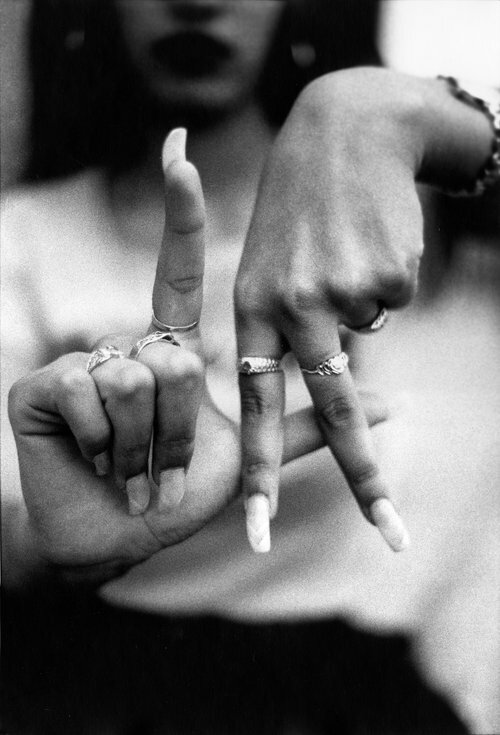 Fingers by photographer and director Estevan Oriol, another artist featured in this exhibit. L.A. Hands. Sculpture by Slick. A closer look at L.A. Hands by Slick. 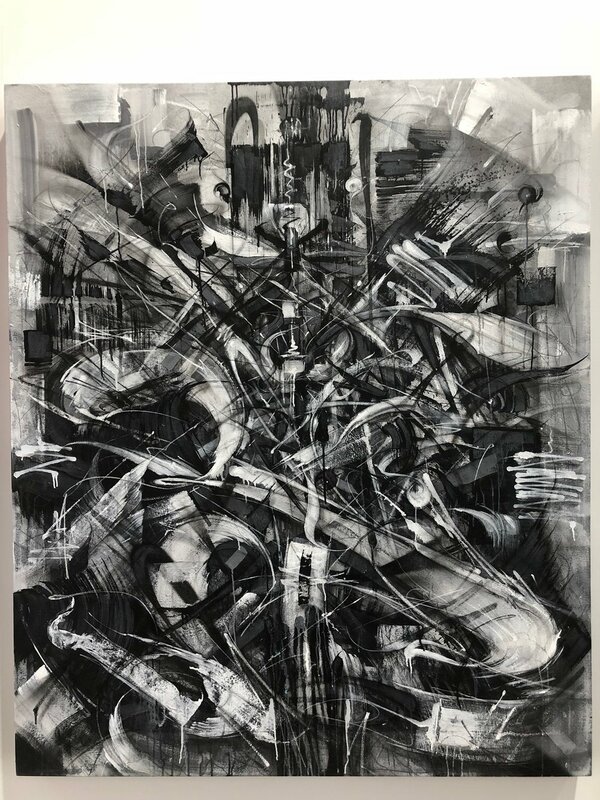 Inspired by the placasos of East L.A. and building upon his own deep roots in the city’s endemic ’80s graffiti style that he helped to create as a founding member of K2S (Kill 2 Succeed), Alex “Defer” Kizu’s artwork features sharp angles and shadowy wisps woven together in labyrinthine patterns. 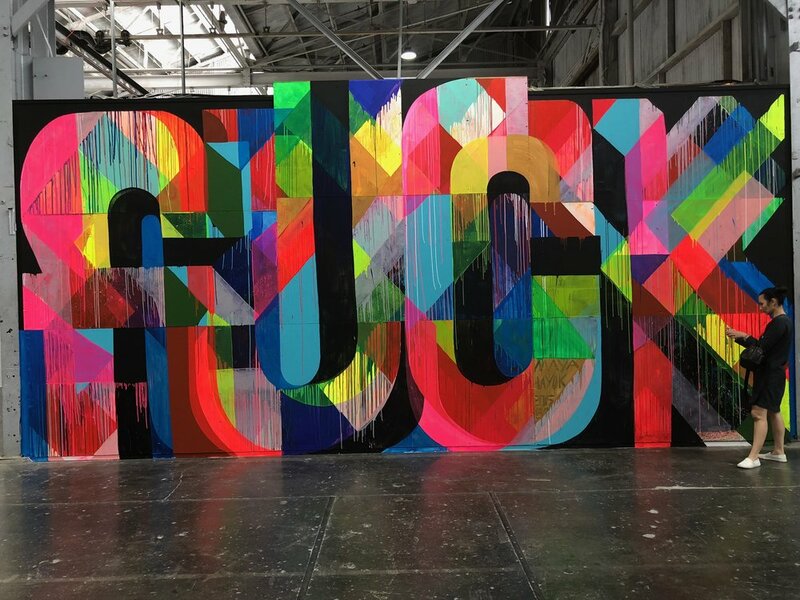 The intricate, abstract lettering of his handstyle and what he calls his spiritual language are mesmerizing enough on flat surfaces (or even recreated on pixelated phone screens). 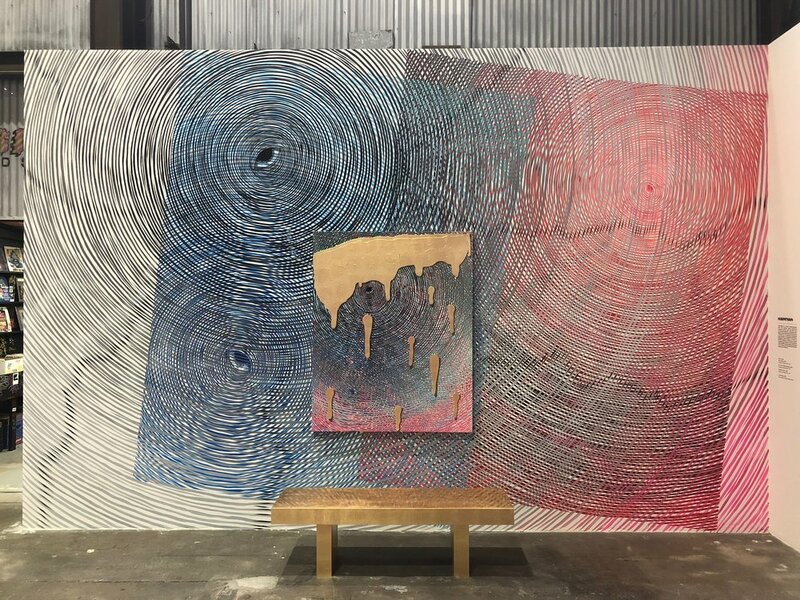 But to see his ornate work on corrugated steel like this adds extra depth and dimension, and burnishes his status as one of L.A.’s most influential artists. Inside a box case at the center of Shepard Fairey’s room at the exhibit, one of the artifacts is a list of 10 wishes handwritten in Sharpie by the artist himself. Item #1 is simply to have more time so he can make more art, but Item #3 on the list can be seen as a pillar of the philosophy behind this entire exhibit, and for the current state of street art itself: “Art and Commerce should work together more; they need each other.” With collaborations between many of the artists in this show and major fashion labels and other corporations like Louis Vuitton, RVCA, Nike, Adidas (an actual sponsor of Beyond The Streets), and Beats, it seems he was prescient. The one-and-only man about town with the pixelated stylings seen far and wide. This is one of the 3,641 (so far) INVADER mosaics in 75 cities around the world. If you’re playing along on the free FlashInvaders app created by French street artist INVADER himself, according to the exhibit’s placard, this is the first flashable mosaic in the game that has an expiration date (July 6, the close of the show). L.A. 172 by INVADER. This is the 172nd INVADER mosaic in Los Angeles and the 3,641st in the world. 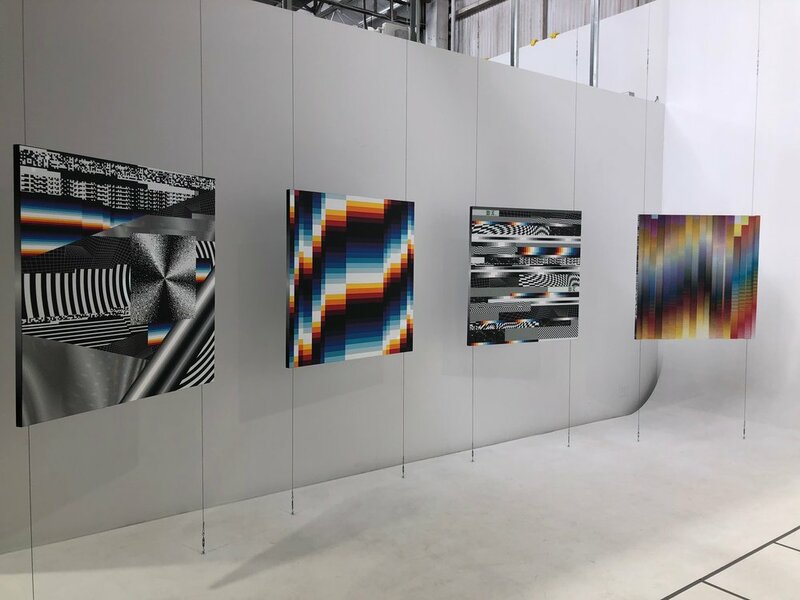 These four drone paintings (literally spray painted by open-sourced drones Katsu engineered to paint any surface), each a yard squared, were set on his poster series of black-eyed Zucks from 2013 (from what I could tell, the most topical part of the show). Clockwise from top-left: Facial Recognition Cops Did Not Notice (2015), Facial Recognition Just Released From Jail (2015), Frozen Screen Feeling (2015), and Trolling Myself Daily (2015). Clockwise from top-left: Facial Recognition Cops Did Not Notice (2015), Facial Recognition Just Released From Jail (2015), Frozen Screen Feeling (2015), and Trolling Myself Daily (2015). I first heard of Cleon Peterson when he added one of his striking murals on our block. His style is instantly recognizable (I’ve seen it copied on clothing, probably without his permission). 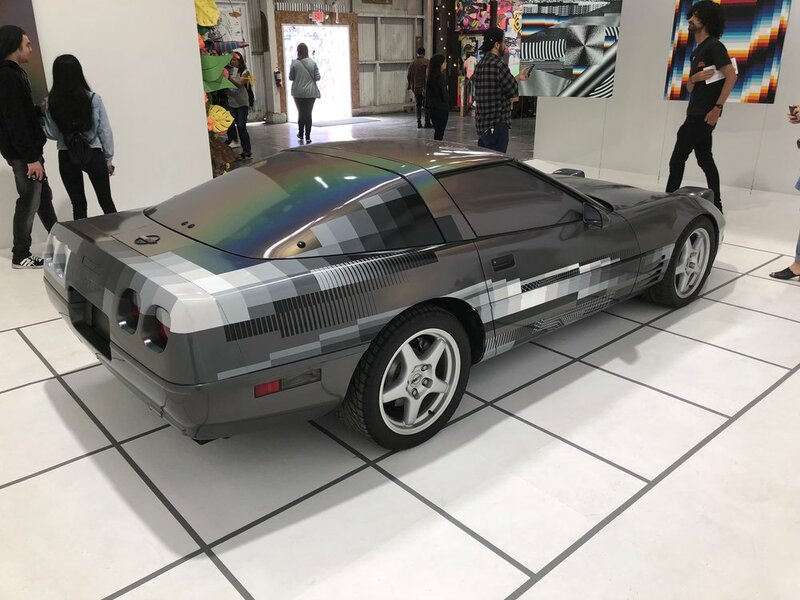 His exhibition Shadow of Men, spanning the entire second floor of the Museum of Contemporary Art Denver, began in February and runs till May 27. Like the sophisticated works of Defer, you can see the hand-lettering roots of SABER’s elaborate designs. Fun fact: The exhibition placard says that SABER created the largest graffiti installation ever along the concrete “banks” of the L.A. River. That piece was 250' x 50' and was visible by satellites from space. These three pieces — Red, White, and Blue — are smaller scale but arresting just the same. This was a fun part of the show. Five people at a time are welcomed into one of his famous Cosmic Caverns, the black-lighted Day-Glo disco-party setups he first started making in the East Village in the ’80s. Untitled works by Sam Friedman. 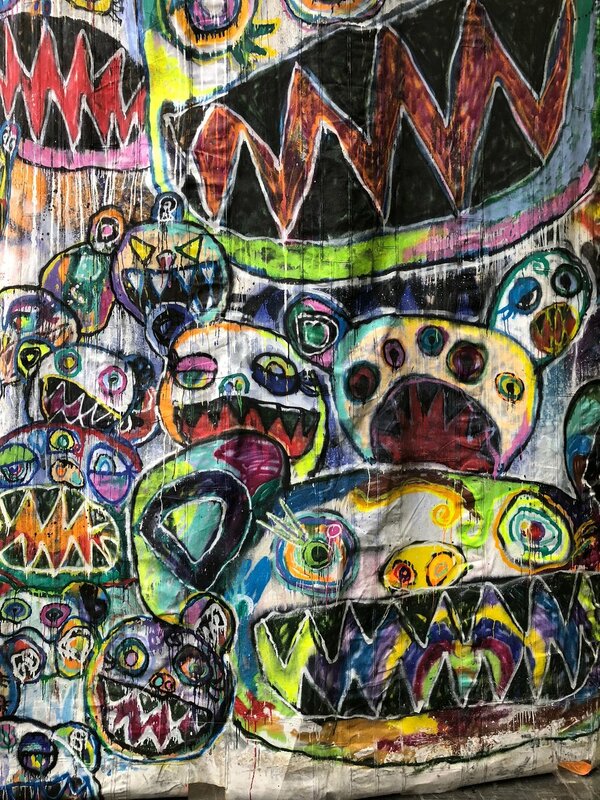 A perfect case study for the artists in this show, Crash (John Matos) is a graffiti pioneer from 1970s and ’80s New York City who’s gone on to bigger things in the art world. He collaborated with Keith Haring, and made a custom Strat (or “Crashocaster”) for Eric Clapton. Another exemplar of the evolution from street world to gallery world, the self-taught Todd James had been an early pioneer of graffiti before expanding into fine art. 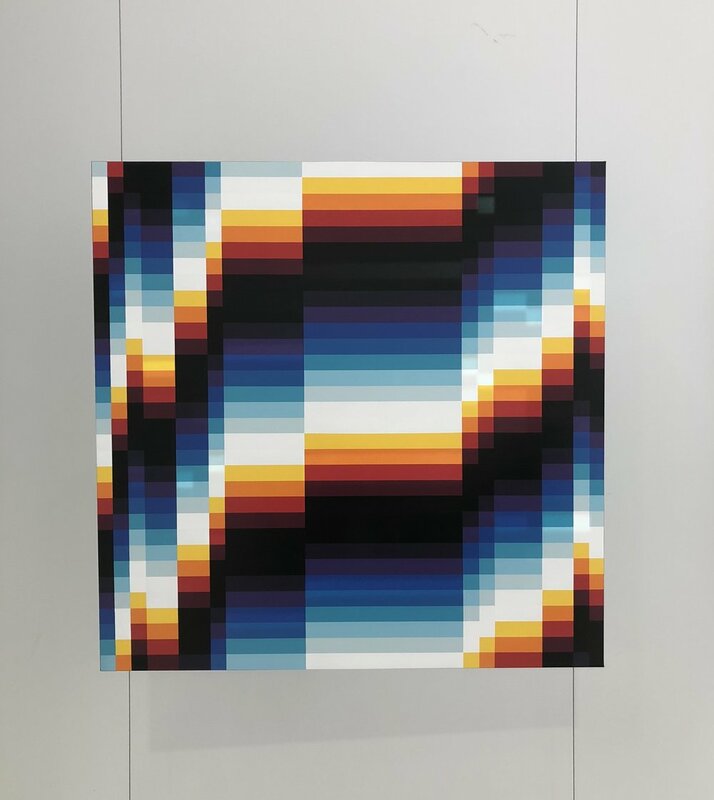 I love these pieces for the way they play with perception simply through flat layering — there are no shadows or tricks of light, only solid colors and shapes, yet the illusion of depth is powerful and immediate. I also learned from Wiki that he designed the Beastie Boys’ Brooklyn Dust Music logo and designed the puppets for Crank Yankers back in the day. He’s been everywhere, high and low. 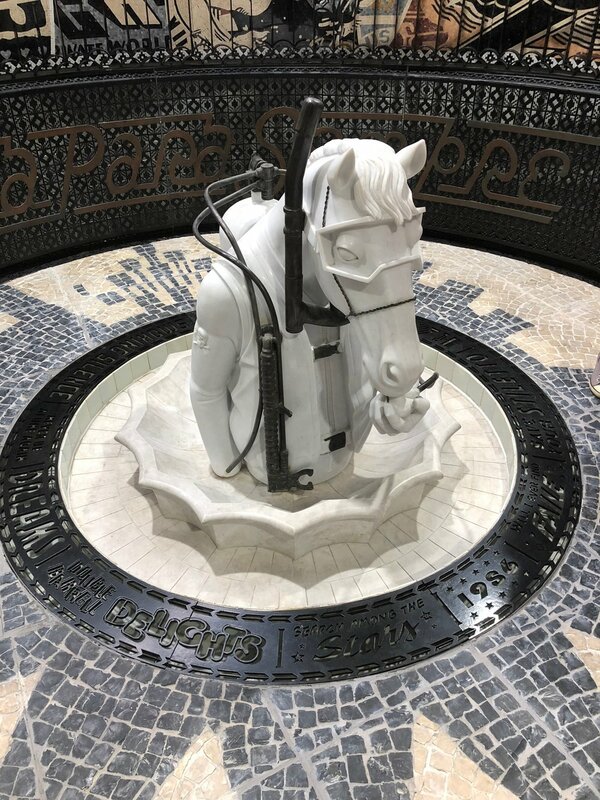 You’ll find this scuba horse and other wondrous details within the makeshift ruins of FAILE TEMPLE, meticulously created by the anti-consumerist Brooklyn-based artist collective FAILE. FAILE TEMPLE inner detail. Sculpture by FAILE. FAILE TEMPLE outer detail. Sculpture by FAILE. In addition to the painting below, multimedia artist and filmmaker Bill Bariminski had an installation that was an entire living room made of cardboard sculptures. He constructs them and lines them in such a way that they appear to be two-dimensional drawings. His cardboard livingroom wasn’t roped off or anything, either; you could interact with the items and sit in the chairs and whatnot. The TV tray with TV dinner is a nice touch, but the best for me was the oversize boombox and cassettes. The gamemaker gets a shoutout for its beloved skateboarding game. 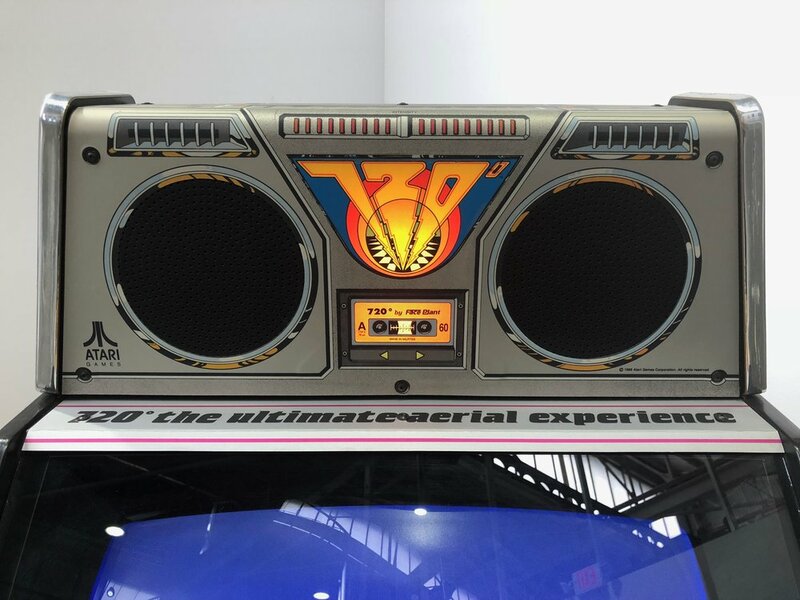 This is the standup arcade version of 720°. You’ll be familiar with a certain catchphrase from the game —“SKATE OR DIE!”—in this game world a literal prompt to hurry up to avoid being stung to death by killer bees and having to start over. This married duo from Melbourne has Pop Art murals all over L.A. (and elsewhere). They went all out to display these three paintings. 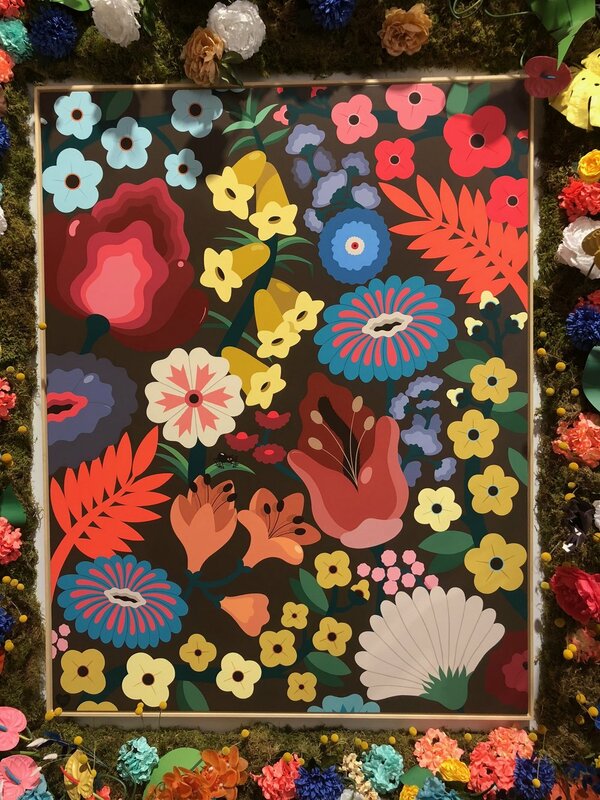 The towering walls of flowers framing their work were a highlight of the show. L.A. Painting (Red) and Blue Figure. Like visual velvet. Looking at more of his work after the show, I could better make out the abstracted human forms here. Neon ladders, neon chimneys, neon smoke. Neon world. Jones often favors these bright, hot colors and white and black contrasts. Hard to pin down, he paints, sculpts, makes cartoons and zines, and works in film and more. Check out this in-depth interview he did with Hyperallergic to learn more about his approach and style. Certainly a big draw for this scene to say the least. The exhibition placard says Bansky spray-painted this particular piece outside the 2017 Basquiat exhibit at the Barbican in London — “an immense private estate near the financial district policed by its own surveillance and security force.” He used Basquiat’s self-portrait Boy and Dog in Johnnypump as the source. 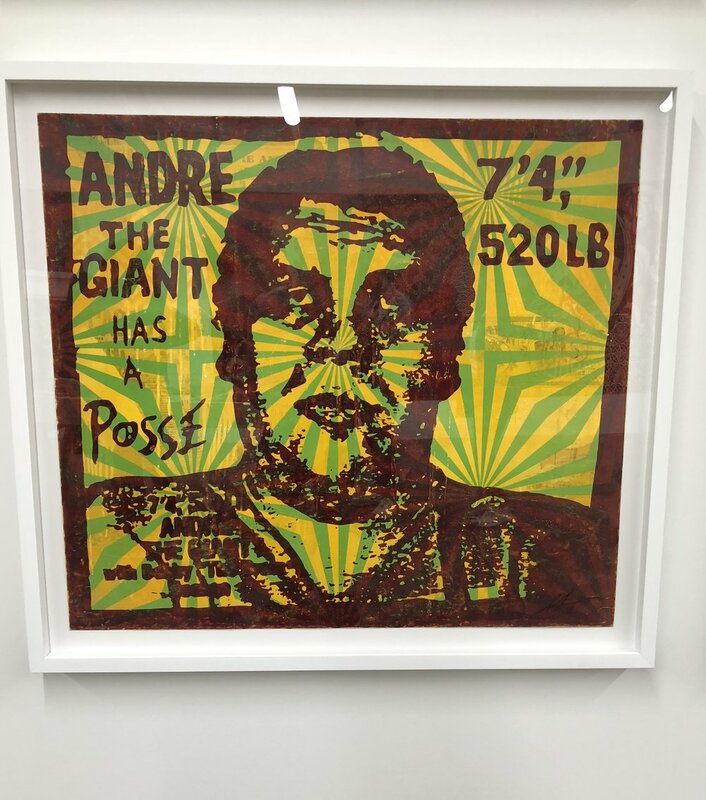 Side note: three original Basquiats are on display at Beyond The Streets. Yup that is one half of a cop car. 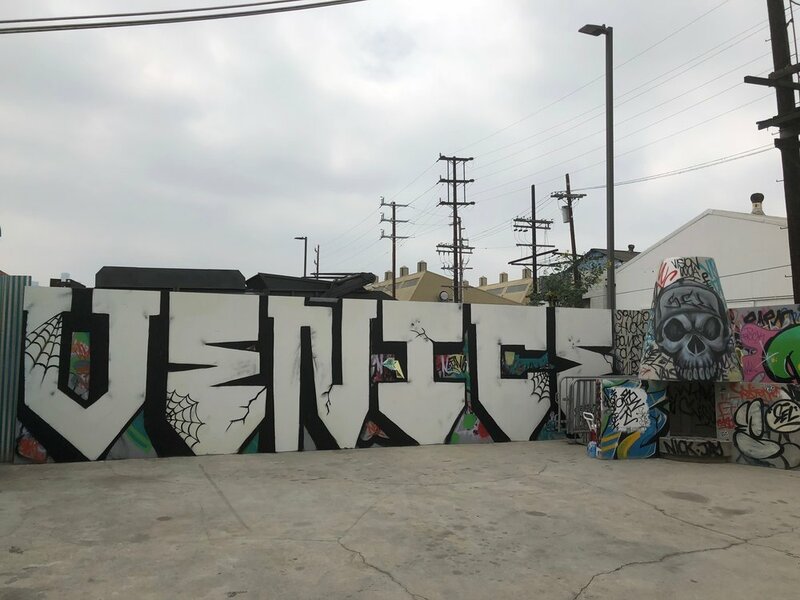 RISK also curated the recreation of Venice Beach Pavilion outside the show, in conjunction with Adidas Skateboarding. Just a replica warhead with a live drive-in movie theater inside. Like, with a movie playing and miniature people enjoying the show from their cars and everything. 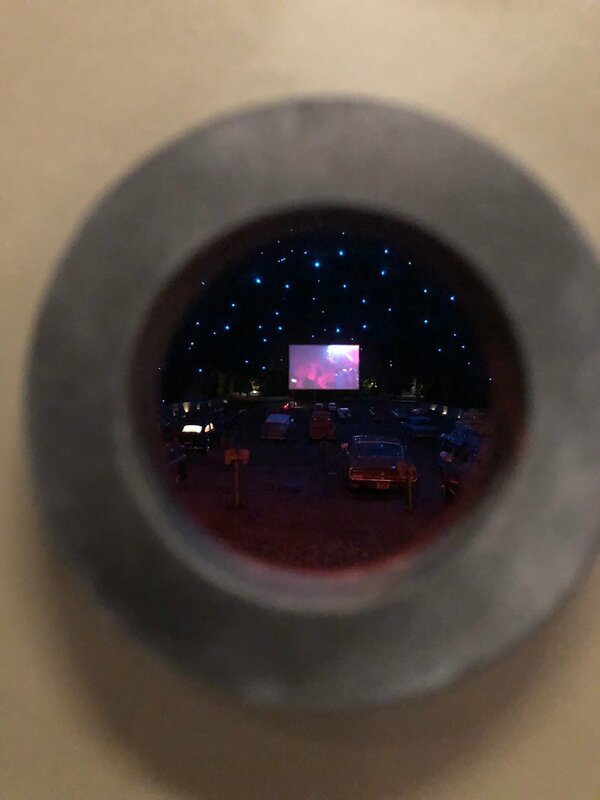 A look inside the drive-in inside the A-Bomb. I walked by this one at first and kind of nodded at it, halfway drawn in, yet was pulled elsewhere by all the other colors and shapes and designs all around. But the second time I passed, I couldn’t resist getting in close. The more I read, the more I loved it. There are other works in the exhibit that zero in on a words to augment a picture. Finding those succinct, diagonal lines to shift your way of thinking is, I think, harder than it looks. For her to bombard us with so many in one piece is impressive. There is a lot of weirdness and wisdom packed in here. Holzer conceptual art is all about communicating words and ideas in public spaces, from posters to sculptured LED signs. André is best known for Mr. A, his top-hatted character spraypainted on surfaces all over the world (including some that have gotten him into trouble). But I keep thinking about this series. He calls them Dream Concerts. It’s hard to see these without wishing they were real, and without dreaming up your own. Explosive color and geometric angles. Hayuk is world-renowned for her gigantic megamurals. These works feature her familiar use of sharp-angled shapes and viviv color, but on a smaller scale. The diptych LOVE SONG opens up like a kaleidoscopic butterfly’s wings. FOUR LETTER WORD speaks for itself. Everywhere her works lives, the application of color is extraordinary. Depicting This Purgatorial World. Standing tall and wide at 236" x 551", this gigantic double-sided canvas is arguably the capstone of the entire exhibit. Sit on that bench and the simmering purgatory feels unsettling. It’s kind of overwhelming. Murakami worked with MADSAKI, snipe1, TENGA one, and ONEZKER in spray paint, marker, and White-Out (!) to make this. Hats off to Roger Gastman, all the featured artists, and everybody who helped bring this astounding exhibition to life. 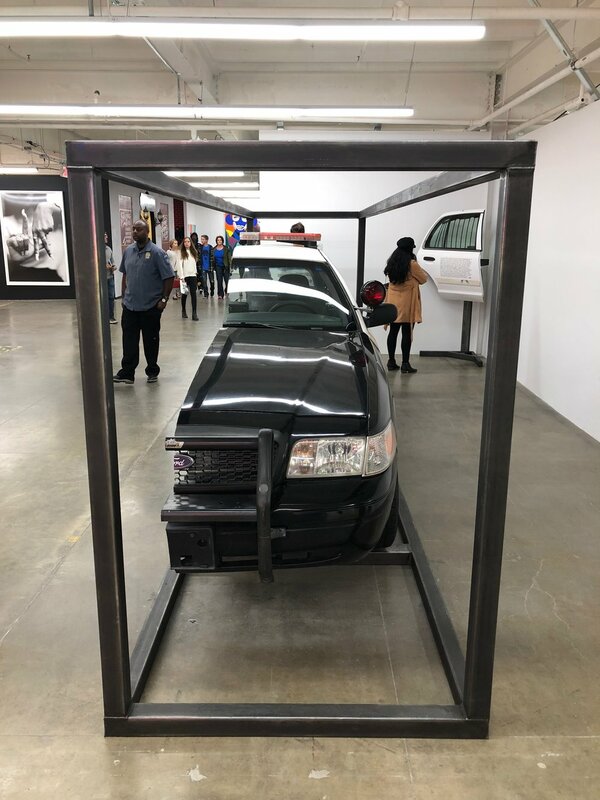 If you are in Los Angeles anytime now through July 6, be sure to check out Beyond The Streets. Tickets are on sale here. Posted on May 21, 2018.